See details GUANTO Stretch Indoor / Outdoor Bespoke Car Cover for the Lancia Delta Integrale - Fully Fitted, made to order. See details Jaguar XK8 / XKR Luxury SOFTECH Indoor Bespoke Cover - Fully Fitted, made to order. 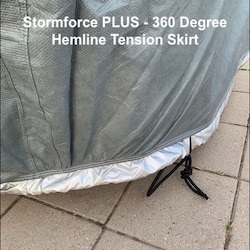 See details VW Type 2 Camper Van / Bus 'STORMFORCE' 4 Layer Luxury Outdoor Car Cover.